Not to be confused with World 8-6. Area 8-6 is the sixth course of Super Skywheel and the sixty-ninth course overall in Mario vs. Donkey Kong: Mini-Land Mayhem!. 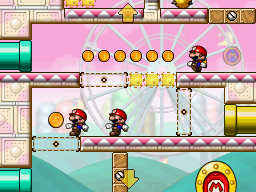 Two Mini Marios begin near the bottom center while the other begins just behind them, with the exit door at the bottom right. In order to reach it, they must simply be guided via a series of Blockers and also activate Pokey Blocks. The M-Token is located at the middle right, just behind the lone Mini Mario's starting position. To collect it, the Mini Mario must be moved in order for the Pokeys to both be moved to their respective Pokey Blocks, then they must simply drop down to it. The Mini Mario Card is located at the top left, just across from the top yellow Warp Pipe entrance. The Mini Marios must enter the Yellow Warp Pipe from its bottom entrance to collect it.